Taxonomists and arachnologists (spider specialists) together have identified more than 40,000 different species of spider over the years. They separated their findings into two groups: opisthothelae and mesothelae. The differentiating factor between these sub-orders are their abdomens. Spiders of the mesothelae sub-order have segmented ganglia and plates as well as four pairs of spinnerets. On the other hand, opisthothelae spiders only have one, two, or at most three spinnerets and no segmented ganglia or plates in their abdomen. An overwhelming majority of spiders fall into the latter category, and only 87 species fall into the former. An arthropod is an invertebrate with exoskeletons, modular appendages, and segmented bodies, and all spiders have these features. Spiders inhabit nearly every continent with the exception of Antarctica, and populate every natural habitat except air or sea. Combined, all species of spider form the largest order of arachnids and are among the top ten most diverse organisms, coming in at seventh place. Nearly all known species of spider are predators, but some can consume 90% or more of their diets from plant sources, making them vegetarian. Typically, spiders prey on insects, but larger spiders will hunt lizards and birds if possible. All spiders have fangs that can secrete venom, but only a handful contain venom that is possibly harmful to humans. Though most spiders die within 2 years, some species of spider such as the tarantula can survive for up to 25 years in captivity. In general, spiders work and live alone, however some have been discovered to demonstrate social interaction with other spiders akin to, but not as sophisticated, insects. For instance, one particular species in the theridiiae family congregate into colonies of up to 50,000 spiders. Some work together only to defend young spiders and eggs, but some also combine forces to hunt and snare prey as well. Spiders are best known for capturing their prey using their webs, and the shape of the web can differ wildly. Regrettably, there is no connection to the type of web built by a spider species and how it is classified in the animal kingdom. In spite of this, spiders can be categorized into orb web spinners and non-orb web spinners. The distinct aesthetic of the orb web is of straight lines spreading out from the center like wheel spokes, and radial strands of web attaching to the spokes. Non-orb webs have no distinguishable pattern and are known as cobwebs. Even though over 40,000 species of spider have been organized into hundreds of different families according to current arachnologists and taxonomists, some scientists argue that it should be further simplified. Since 1900, approximately two dozen proposals have been made to order the spiders in different ways. In addition, there is much scientific controversy and confusion regarding ongoing research that may change how spiders are categorized. 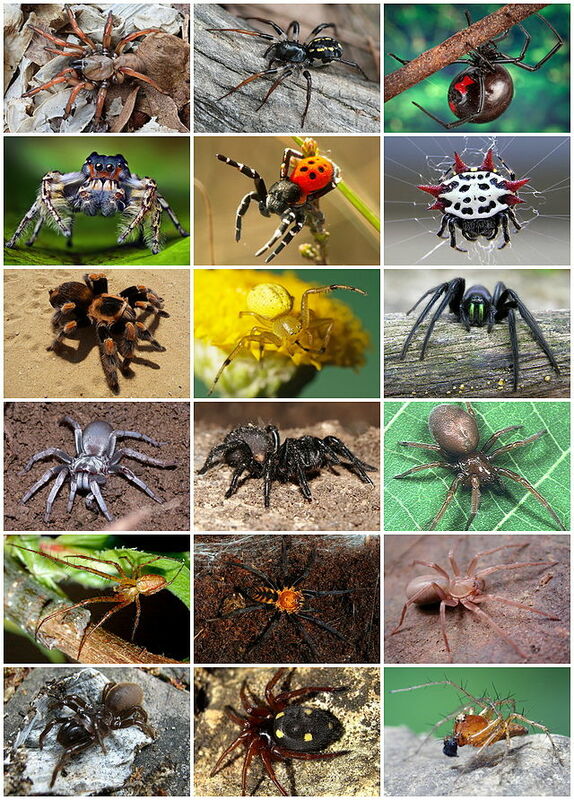 Photo Credits: “Spiders Diversity” Licensed under CC BY-SA 3.0 via Wikimedia Commons.